Can You Assign Your Insurance Benefits to Someone Else? Most business insurance policies contain a so-called anti-assignment clause. This clause prohibits policyholders from transferring any of their rights under the policy to someone else. This means that the insured business cannot cede its right to collect claim payments to another party. However, laws in most states permit policyholders to transfer their rights to another party under certain circumstances. In the standard ISO policies, the anti-assignment clause is located in a separate form called the Common Policy Conditions. These conditions apply to all coverages that are included in the policy. For instance, if a policy includes business auto, general liability, and commercial property coverages, the anti-assignment clause applies to all three coverages. Your rights and duties under this policy may not be transferred without our written consent except in the case of death of an individual named insured. The anti-assignment clause prohibits the named insured from transferring any of its rights or obligations under the policy to someone else without the insurer's permission. The only exception is if the named insured is an individual (sole proprietor) and he or she dies. An assignment is permitted in this case because a sole proprietorship and the individual owner are one and the same. If the individual dies, the business cannot survive unless it is sold to someone else. An anti-assignment clause is intended to prevent the insurer from unwittingly assuming risks it never intended to take on. Commercial insurers review business insurance applicants carefully. Before they issue policies, underwriters consider the knowledge and experience of a company's owners and managerial staff. If a business is sold to someone else, the new owners may not be as skilled or attentive as the previous ones. From the insurer's perspective, the new owners are an unknown risk. The anti-assignment clause doesn't distinguish between assignments made before a loss and those made afterward. Even so, courts in most states have allowed policyholders to assign their rights to another party after a loss has occurred. Pre-loss assignments are still prohibited. Here is an example of a post-loss assignment of insurance benefits. Victor operates a restaurant called Vital Vittles out of a building he owns. Late one January night two water pipes in the building freeze. The pipes subsequently burst, causing considerable water damage to Victor's building. Victor is forced to close his restaurant until the repairs are completed. Victor hires a water damage contractor called Rapid Restoration to repair the damage to his building. He tells the contractor that he needs the repairs done quickly as he is anxious to reopen his restaurant. The contractor says that the repairs can be expedited if Victor signs over his rights under the policy to Rapid Restoration. The contractor will then proceed with the repairs and negotiate a claim settlement with Vital Vittles' commercial property insurer. Victor agrees to the assignment and the contractor begins the repair work. While Vital Vittles' commercial property policy contains an anti-assignment clause, Victor has assigned his rights to Rapid Restoration after a loss has occurred. Thus, in most states, Victor's insurer cannot reject the assignment (assuming post-loss assignments are permitted in Victor's state). In recent years, assignment of benefits (AOB) agreements have been problematic in some states, particularly Florida. Unscrupulous contractors have preyed on unsuspecting homeowners and business owners who have suffered water damage. Some contractors work alone while others operate in cahoots with crooked lawyers. In either event, the contractor convinces the policyholder to assign his or her rights under the policy over to the contractor. The contractor then exaggerates the cost of the repairs and collects the inflated amount from the insurer. The policyholder is left with a large claim on his or her loss history. When the policy expires, the insurer may refuse to renew it. In the previous example, Victor has assigned his rights under the policy to Rapid Restoration. Suppose that Rapid Restoration completes only half of the repair work on Victor's building. The actual cost is $15,000 but the contractor submits a bill to the insurer for $30,000. Alternatively, the contractor never submits a bill but sues the insurer for $30,000. In either case, the insurer may refuse to pay on the basis that the contractor has committed insurance fraud. Victor cannot intervene because he has signed his rights over to the contractor. If the contractor is unsuccessful in its lawsuit against the insurer, it may demand payment from Victor's company. Report any loss or accident directly to your insurer (or your agent or broker). Notify your insurer immediately. Don't allow a contractor to do the notification on your behalf. Vet contractors thoroughly before hiring them. Make sure they are properly licensed. If your area has suffered a natural disaster, watch out for construction scams. Don't sign an AOB unless you have reviewed it carefully. If you don't understand it, ask your agent, insurer, or attorney for assistance. If your contractor won't do any work until you've signed an AOB, find another contractor. Assignment of benefit agreements are common in health insurance. Patients are often asked to agree to such clauses before they receive treatment from a physician, hospital, or another healthcare provider. The assignment of benefits clause transfers a patient's right to collect benefits under his or her health policy to the provider. 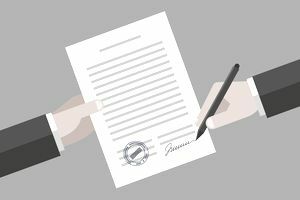 By signing the document, the patent agrees that payments will be made directly to the provider for the services rendered. The clause states that the patient is ultimately responsible for the charges if the insurer fails to pay. Once the treatment has been performed, the provider submits the AOB along with a claim to the patient's health insurer. The insurer pays the provider for services rendered to the patient.